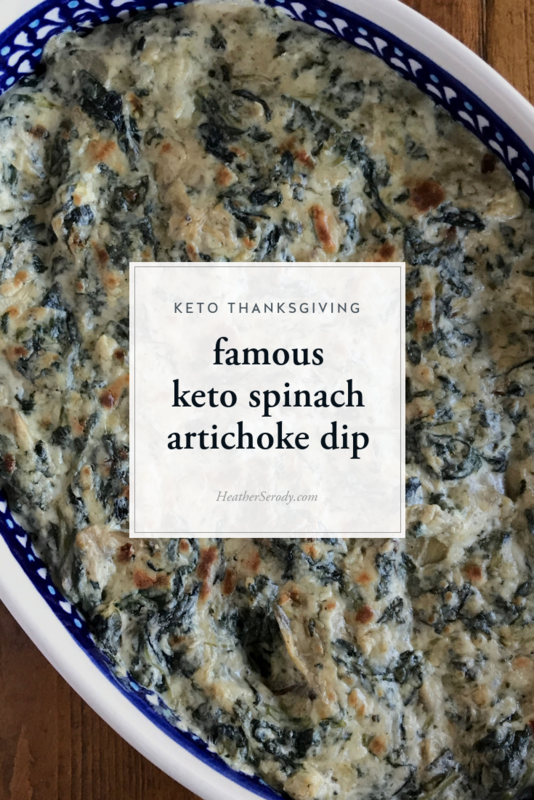 I got the idea for this recipe when I was brainstorming foods that would naturally reflect the ideal macros of a low-carb, high-fat ketogenic diet – 75% fat, 20% protein and 5% carbs. I love that the keto way of eating includes the yummiest foods you can think of. 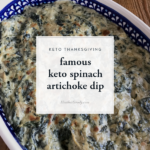 For so many years I restricted myself from enjoying spinach artichoke dip when I was afraid of fat and followed the eat less, move fallacy. 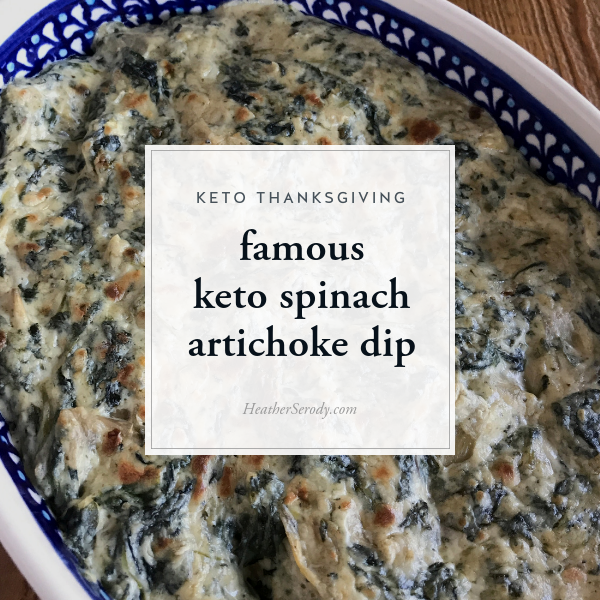 So, I went on a mission to create the best damn spinach artichoke dip in order to make up for all those missed opportunities. 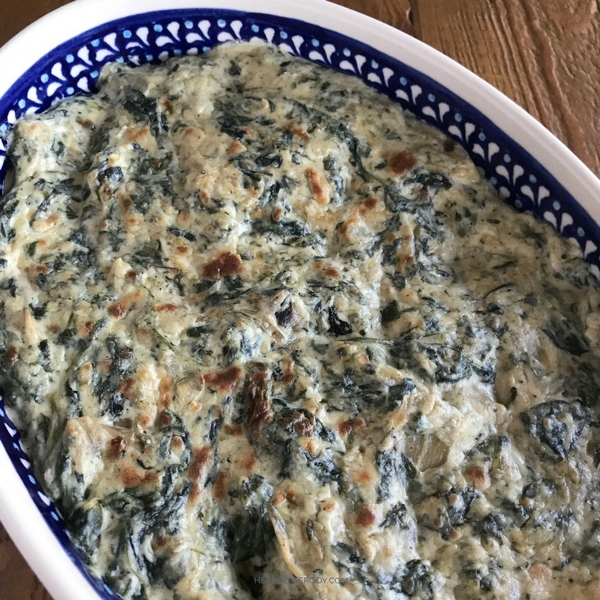 Sweet Jesus, it's the best damn spinach artichoke dip I've ever had; destined to be famous, just like my famous grilled salmon recipe. I always serve this as part of my low-carb Thanksgiving meal plan. You can serve it as a side dish or as an appetizer. Either way, people will freak out when they taste it and think you are really something special. Then they'll ask you for the recipe! For a low carb appetizer, serve with parmesan cheese crisps & celery sticks. Turn on broiler to medium setting and set oven rack to the top 1/3 setting. Heat a large frypan over medium-low heat and add olive oil & garlic and sauté for a minute or so, stirring so that the garlic does not brown. Add chopped spinach, salt & chili pepper and cook until the spinach is wilted, tossing lightly with tongs. Turn the heat up to medium & add drained artichoke hearts, cooking for another 2-3 minutes, stirring occasionally. Add cream cheese, mozzarella, & sour cream and continue to cook until the cheeses melt and everything starts bubbling. Transfer dip to an ovenproof dish and place under the broiler for about 5 minutes, or until the top browns. Eat hot from the oven or room temperature. This recipe was adapted from this one from The New York Times.